The Fourth of July has several meanings to different people. For some, it is just another day off of work; a government holiday. Some people feel it is a time to celebrate family, come together for BBQ dinners, and lemonade refreshments. Others celebrate the America that we know today, celebrating all of the freedoms that were declared back in 1776. The 4th of July is iconic Americana. Red, white and blue, the colors that scream I’m proud to be an American! For most, not much compares to this holiday. It’s what brings the whole family together for some summer fun. It’s what kicks off summer, gets the grills going, and water balloons throwing. But once it’s over, then what? 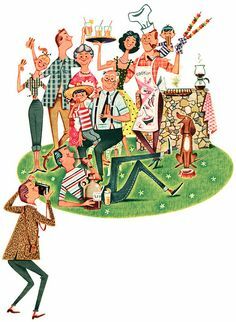 After visiting family in the middle of June, having family stay with us during the end of June, and then seeing other family the Friday before the 4th of July, it hit me; why is it mostly holidays, or special events that bring us together? Summer was officially here on the 20th of June, why do most wait until the 4th? Yes the holidays can be the perfect time for everyone to come together as a family clan, the reasons vary but for most it’s because we are all (usually all) off from work, and kids are out of school (mostly all). Why confine ourselves to the 4th of July, and then Labor Day? If we follow that patter the next time we see our loved ones will be November, if we’re lucky! Don’t get me wrong, I love the time off from work, and spending time relaxing in the backyard with my family as much as the next person. And who doesn’t enjoy watching fireworks? It’s literally fire in the sky! For my family, we’ve just always been the type to put more emphasis on family time away from the holidays, than to try and combine both together. Maybe more so now due to the fact that my husband and I now have child. Or perhaps, it’s due to the fact that I haven’t been able to see my close family as much as I would like to lately. Or it’s a combination of both! All I know is I am more determined than ever to make sure that family is a priority! Not waiting for holidays, or special occasions to visit and catch up. Especially if we are within close proximity to each other. Cousins are our first friends, they are always there when we need them, and when we don’t want them. But we love them even more for it and that will never change that for anything! So this is my summertime goal, what about you? What are your summer goals?